‘I cried so hard’ is a story of true love – the adoption of a blind cat and the happiness that followed. For me there is almost nothing so good, so touching and meaningful than a good woman adopting a cat that so needs a good woman to care for her. The words of the title are those of Angela. They refer to the moment when she held Mea for the first time having travelled half way across the United States to adopt her. 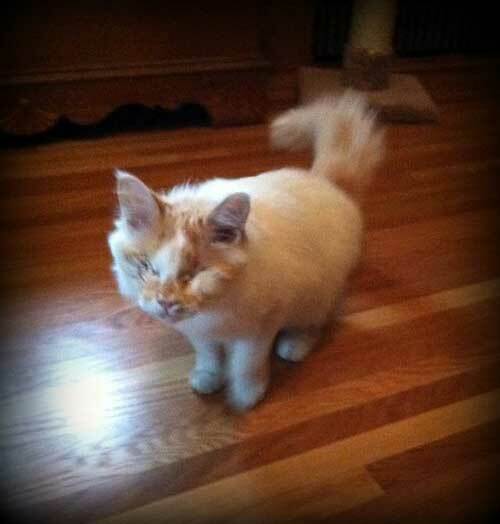 Mea is blind because of a very severe eye infection. The vet had to remove her eyes. Mea was adopted from the Last Chance Animal Rescue and is originally from Florida. Mea is a little sweetheart. She made no complaints about the long journey to her new home in Nebraska. On the car journey from the airport she showed her happiness by rubbing against her new human companion and cuddling up. Mea has settled in very quickly. She has made best friends with Peanut another cat companion of Angela’s. Mea familiarized herself with her new home in the same sort of time frame as a fully sighted cat. Blind cats are so competent and adaptable. Mea is a cuddler and lover and I am sure she is very happy. She was lost and is now found. You wouldn’t know she was blind. This is her Facebook page. This entry was posted in Animal Rescue, Cat Behavior, Cat Disability, Cat Health, Infection and tagged blind cat, cat rescue of blind cat, last chance animal rescue by Michael Broad. Bookmark the permalink. It is always heartwarming to watch disabled animals. We could learn so much from them. They never feel sorry for themselves. They just carry on with the same zest for life they were born with. Loved seeing Mea. Thanks Michael. Blind cats are still cats. It’s truly amazing. I have a soft spot for blind cats and disabled cats. I wonder if all people who warm to disabled cats have had an uncomfortable childhood.